We may not be able to make a “Chanel jacket” but Gabrielle Chanel would have been flattered by sewers devoting endless hours to emulate her work. In order to avoid the “home sewn” look, you need to get the fit of your jacket perfected, especially the shoulders and sleeves. Too many jackets appear that are much too large through the shoulders. Most commercial patterns have sleeves which are much too wide and the whole effect of the chic jacket is lost. The three piece sleeve seems to be the holy grail of Chanel jackets. I found almost nothing published on how to draft this sleeve and so began my quest. This post will demonstrate my method of drafting a three piece sleeve from an existing two piece sleeve. 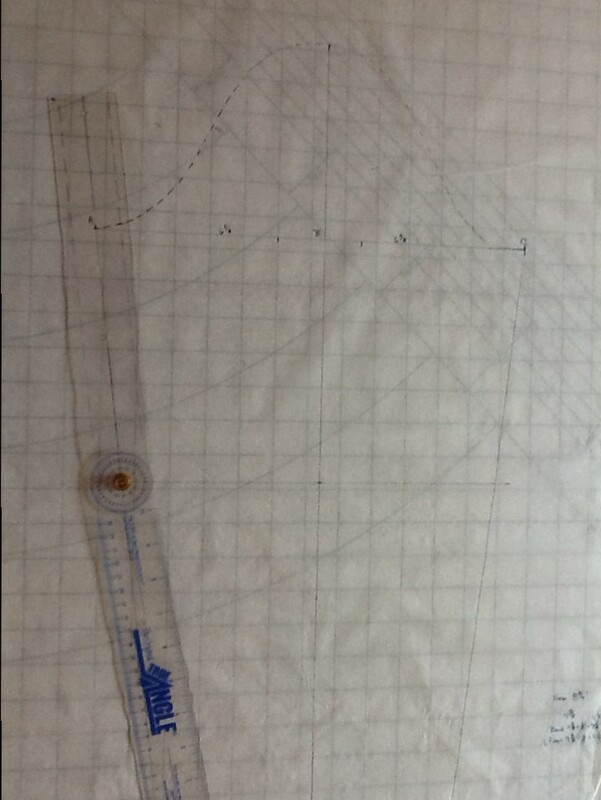 Future posts will explore custom sleeve drafting and some radically different sleeve shapes. First I’ll deal with the armseye shape. The scye, as it’s referred to in professional tailoring language, is the basis for beginning the sleeve draft. If your jacket has the wrong shape and size armhole, you have no chance of getting a correct sleeve fit. Perfect your muslin fit and make any changes necessary to the sleeve before proceeding. You will also need to remove all seam allowances from the pattern. 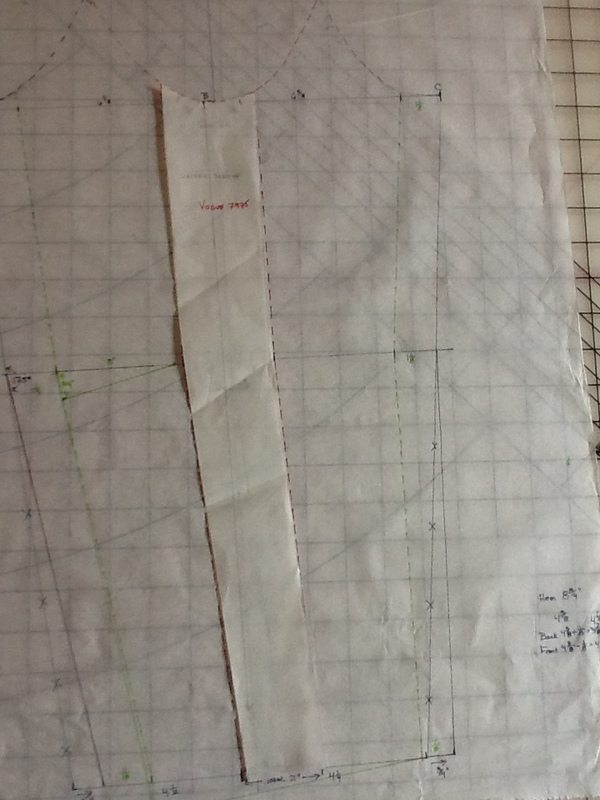 All professional pattern drafting is done without seam allowances. If you try this process without removing the seam allowances, things will become muddled very quickly. Sorry to those who prefer to work with seams added. 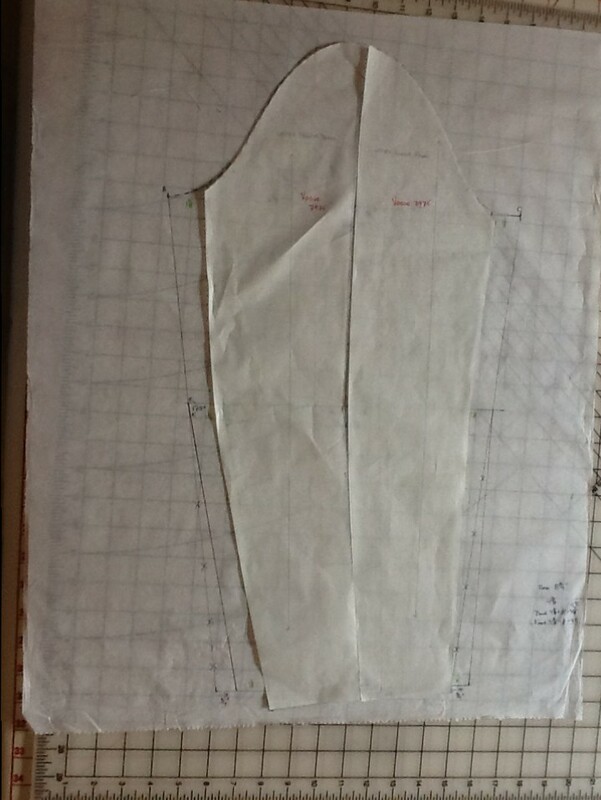 The scye shape is easiest to visualize by laying the jacket body sections on a grid with the armhole seams just touching and all grain lines parallel. The scye from a Chanel ready to wear jacket. Scye shapes overlaid showing the small variations. I’ll use Vogue 7975 as the example of how to draft a three piece sleeve. This is a pattern used by many as the basis for their Chanel style jacket. It also has a two piece sleeve, perfect for demonstrating how to transform it into the coveted three piece draft. The McCalls pattern shows what to avoid. 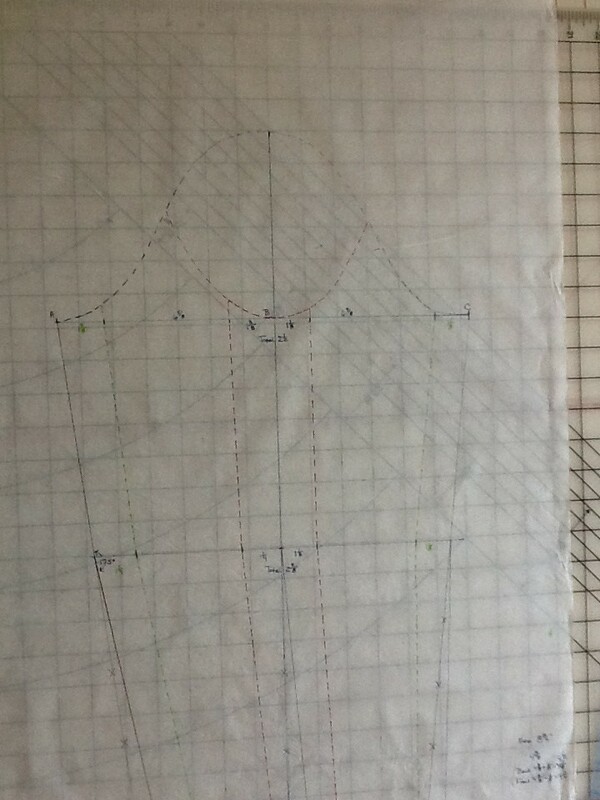 It should also be clear from these diagrams that substuting one sleeve pattern for another can be risky. Imagine trying to get the sleeve from Vogue 7975 into the McCalls armhole. 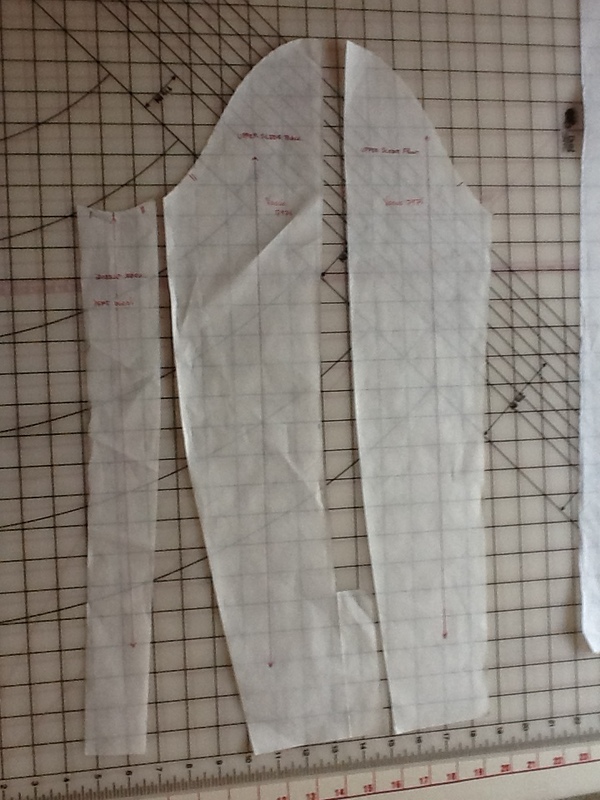 Sleeves are drafted to correspond to a specific armhole shape and size. You might get away with switching the Vogue sleeves but even that might require some tweaking. The first step may appear counter-intuitive, but I found it easier to return the two piece draft to a one piece and then draft the three. Altering and combining the two piece into three created multiple issues and this approach worked better for me. Start by aligning the grains and have the seams just touching. Remember, NO SEAM Allowances. 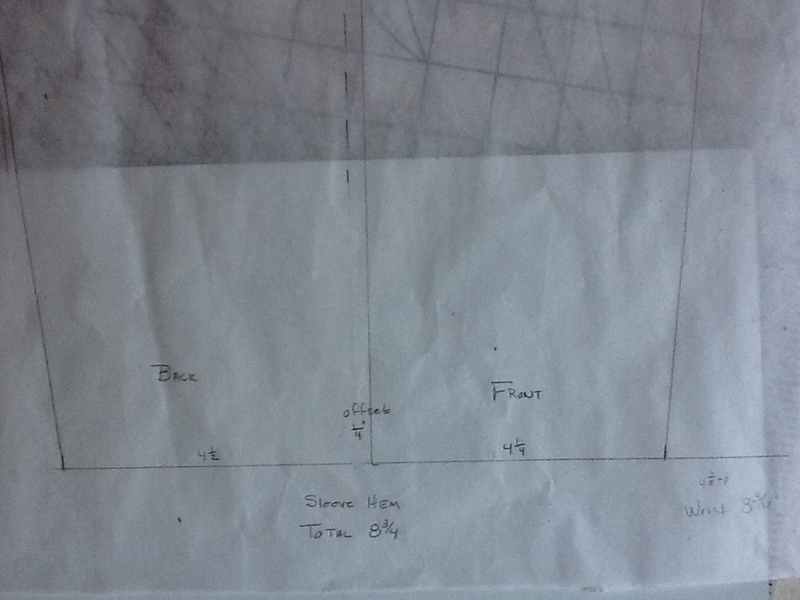 Trace the sleeve cap shape onto paper, either gridded or plain. Stop the tracing at the underarm match point on both front and back. You should now have a sleeve that looks like this. Don’t do anything with the lower sleeve yet; all you want is the shape and size of the armseye seam. Connect the underarms with a straight line. From the shoulder match point drop a line straight down which intersects with the underarm line at right angles. Make it a few inches longer than the sleeve length. Measure and mark the sleeve length from the top of the sleeve cap to the hem. Mark back and front as its easy to get confused until you’ve done this a few times. The back will be slightly wider than the back. I’ve written 6 5/8 on the back and 6 3/8 on front. Now mark A, B and C as shown. Cut along the sleeve cap line. Fold point C directly on top of point B and trace the underarm seam. 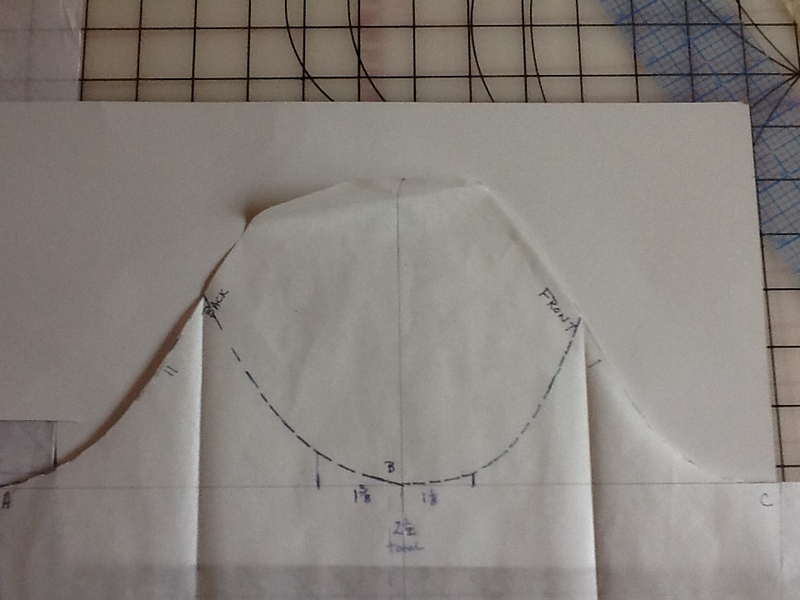 Fold point A directly on top of B and trace the underarm seam. Measure out along the underarm line 1 and 3/8 inch left of B. Measure 1 and 1/8 to right of B. You are starting to form the undersleeve piece. Next you need to draw in the bottom of the sleeve. Measure the finished width of the sleeve hem. Size 8 measured 8 and 3/4 inches. 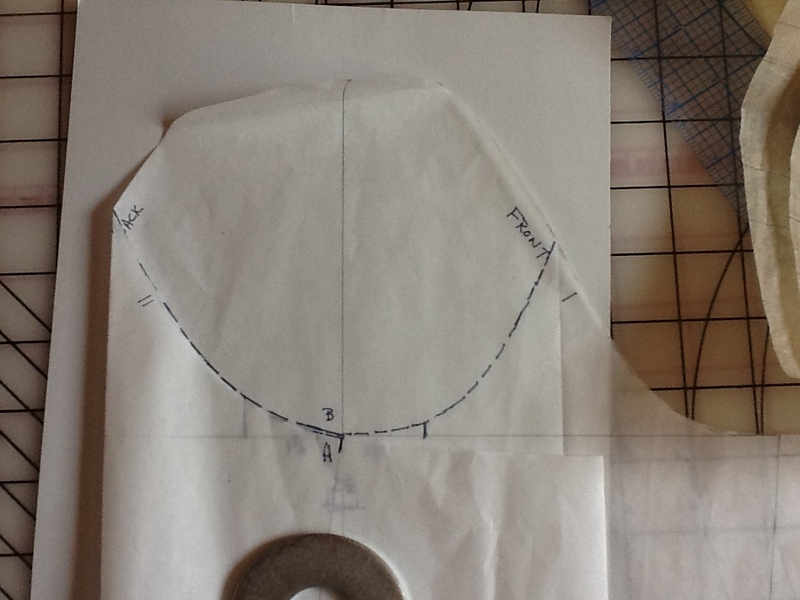 The line down the middle of the sleeve is offset 1/4 inch towards the sleeve front; 6 and 5/8 along back underarm, 6 and 3/8 along front underarm. Therefore you need to offset the hem by the same amount. Sleeve hem measures 8 and 3/4, half of which is 4 and 3/8. Add 1/8 inch to back and subtract 1/8 inch from the front. Your sleeve hem will measure 4 and 1/2 inches along back sleeve and 4 and 1/4 inches along front sleeve. The sleeve needs to bend at the elbow to follow the natural shape of the arm. Every drafting source I found used arbitrary values to establish this bend. 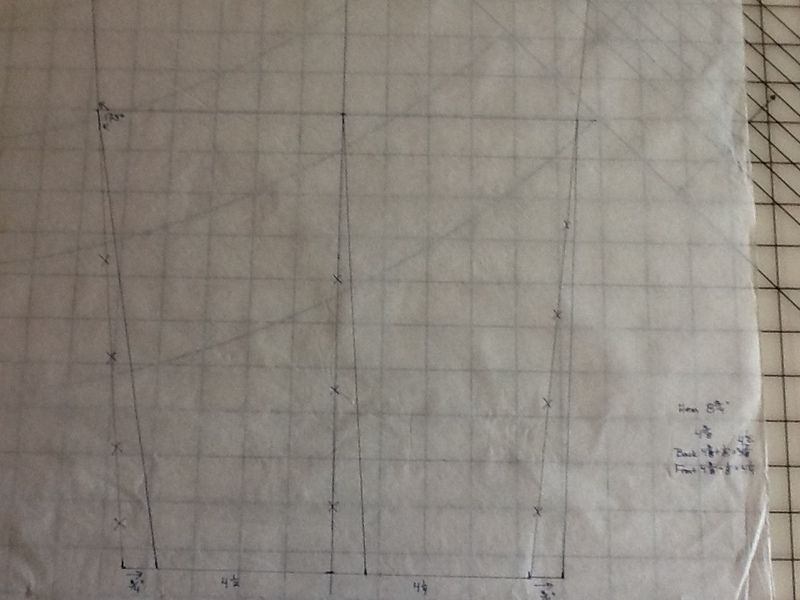 After measuring countless arms and sleeves I decided what made more sense was to duplicate the angle. A perfectly straight arm would have a straight line from top to bottom. Most peoples’ arms bend at about 175 degrees with the elbow as the pivot point. The dress form with sleeve showing this angle. A Chanel sleeve from a ready-to wear jacket showing this angle. 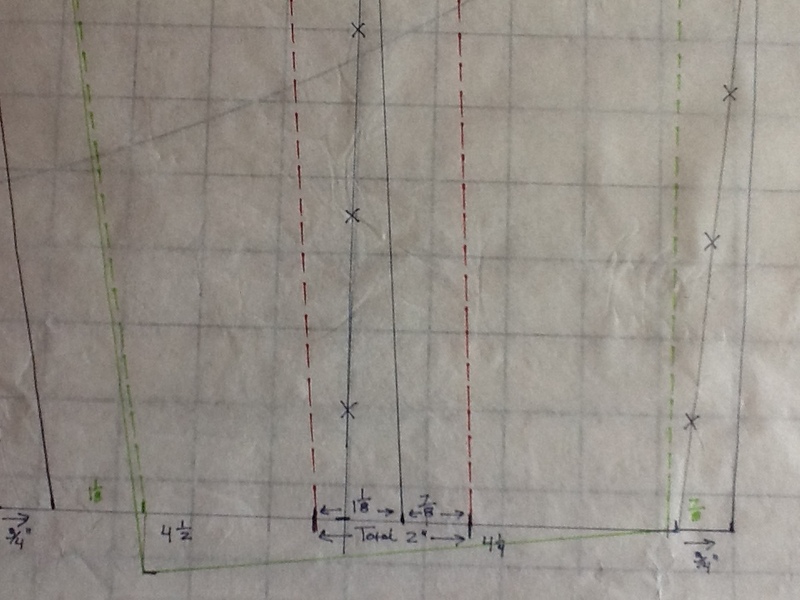 This shows a two piece sleeve but the angle remained remarkably consistent with everything I measured. Therefore, I decided to draft the lower sleeve to reflect this angle. Draw a horizontal line where the elbow bends. Measure from the top of the sleeve. This measurement isn’t critical so just get close but don’t go crazy trying to find the exact point. This is the elbow line. This pushed the seam 3/4 inch towards the right. 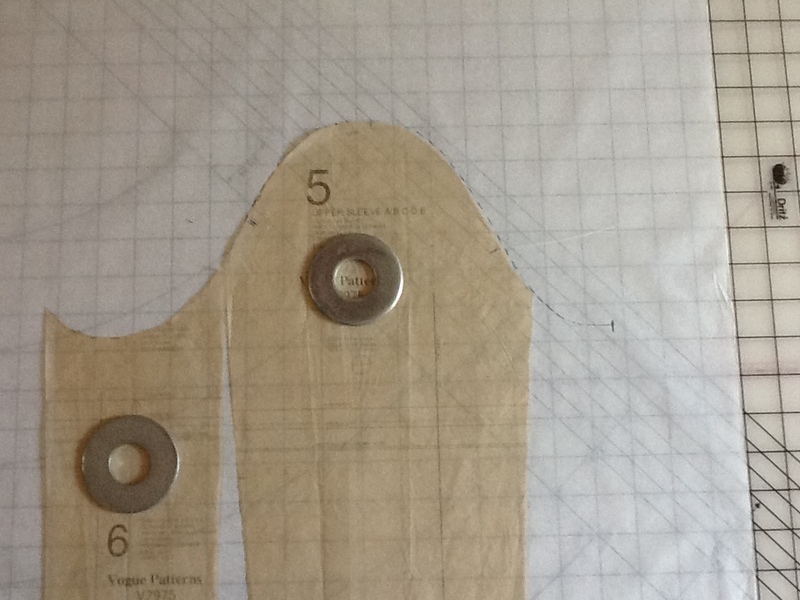 In order to maintain the width at the hem, the center line and front seam needed to be redrawn 3/4 inch towards the right. Come straight down from the sleeve top, pivot at the elbow and continue to the hem. To finish the under sleeve pattern measure out along the elbow line 1 and 1/4 inch towards the sleeve back (left of center) and 1 and 1/8 inch towards the sleeve front (right). At the hem measure 1 and 1/8 inch towards back and 7/8 inch towards front. Connect the points from the underarm line through the elbow line and pivot to hem. Your undersleeve should look like this. It is is red. In order to complete the back and front upper sleeve patterns, the width of the undersleeve needs to be subtracted from the upper sleeve pieces. 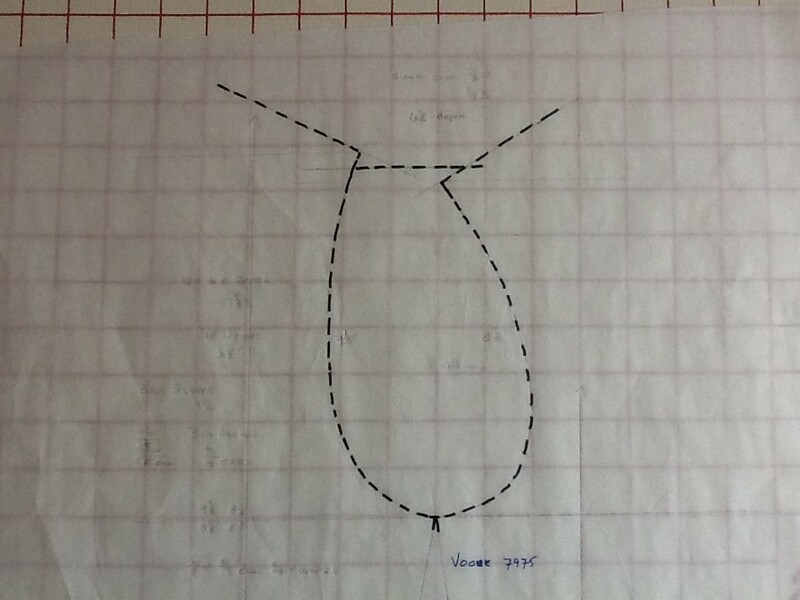 Along the back seam, measure in 1 and 3/8 at the underarm, 1 and 1/4 at the elbow and 1 and 1/8 at the hem. 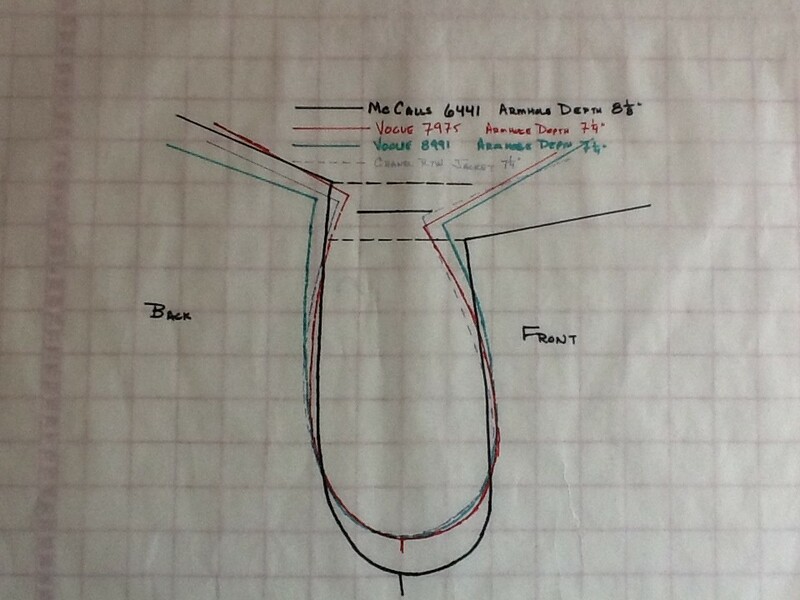 Along the front seam, measure in 1 and 1/8 at the underarm, 1 and 1/8 at the elbow and 7/8 at the hem. These lines are shown in green. Add ease to the back upper seam to allow the elbow to bend. Measure down 3/4 inch from the elbow line and form a dart about 3 inches long. This will be eased into the seam. 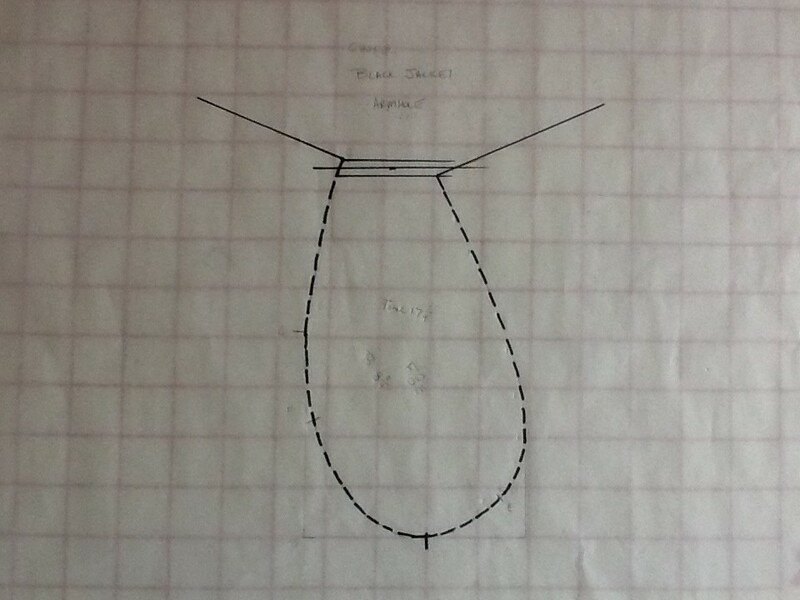 The seam needs to lengthened by the same amount so lower the hemline 3/4 inch and angle upwards to the front seam. Trace off the under sleeve, shown in red. Be sure to mark front and back. The upper sleeve is for the RIGHT sleeve, the under sleeve is for the LEFT sleeve. This pattern gets flipped for the right sleeve. Don’t get confused. That’s just the way this draft works. Trim the upper sleeve pieces along the green lines and along the center line. They can look similar so be sure and label them before you cut apart. You can also trace them to save your master draft. Next will be a mock up to test the fit and adding a working vent. This post took hours to write and I hope not too confusing. I am going a little buggy now and hope it makes sense. Please let me know if any steps need clarifying and I’ll address questions in the next post. This was a while coming but I think most of the glitches are worked out. Next is custom drafting the sleeve cap. Wow, you really devoted a lot of time to this. Thank you for all the useful information. This is a post to bookmark for when I make another jacket. Glad you found it useful. I’ll watch for your next jacket. Please let me know how this method works for you. Thank you Mary, once again, for your generosity in sharing your hard won understandings and knowledge! So very timely too, as I myself have been obsessing over just this lately. Why do you think Chanel opted for the 3 piece sleeve, as fit does not seem to alter from the 2 piece- was it simply to position the vent on the top of the arm? And what have your researches informed you regarding ease? Sorry to be so greedy for info, but your blog is one of the few (only?) which concerns itself with these questions at this level! Again, many thanks! Cheers, Robyn. Aside from positioning the vent to be more prominent the additional seams allow for more precise fitting. The seams also allow the fabric to be shaped with steam before construction? A technique, calage, which separates haute couture from luxury ready to wear is the shaping of garment sections to mold the shape into the fabric. This makes it possible to match plaids and stripes and use the design of the fabric in ways not possible with conventional cutting. The current exhibition at the NY Metropolitan by Charles James has several examples of this. He also used a high, tight sleeve and experimented with grain lines to achieve a perfect fit. More to come on that topic also. I’m still experimenting with ease and have read every theory ranging from no ease to 10 percent ease. Will keep you updated. Thanks for following and I hope you enjoy. 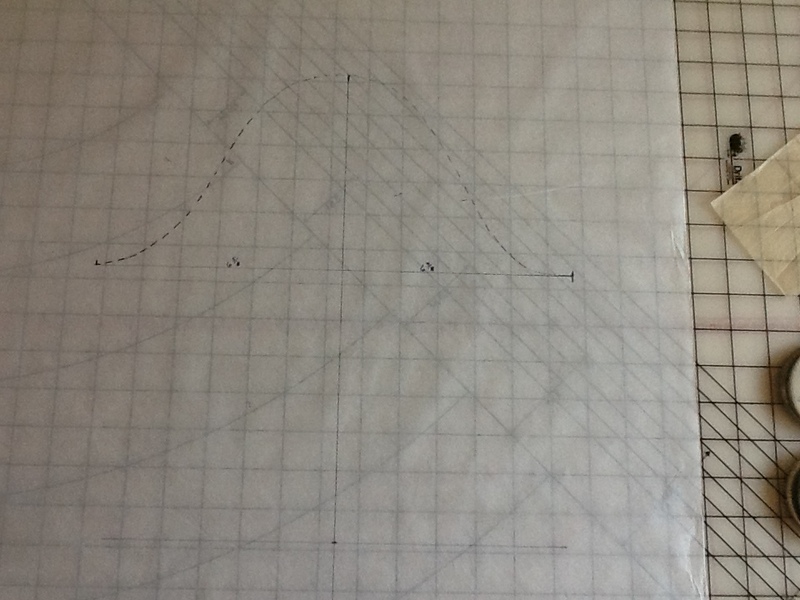 I LOVE your indepth study of patternshapes and drafting. I went to pattern design school mainly to figure out the shape and engineering of the sleeve. Thanks for the recent post. I love it! Thanks. I wonder how the methods you were taught differ. This is the result of my self teaching. actually quite similar to your method. three piece sleeves are seldom drafted and you clearly explained why they are used. commercial patterns generally require both pattern and fit adjustments which make sewing frustrating to those w/little pattern knowledge. i am hoping to get to the met in a few days when visiting family in east coast. Thanks Julie. I’ve enjoyed following your summer posts and am waiting for Susan Kahljie to release her take on the Chanel jacket. It will be interesting to compare notes. I made it to the Charles James exhibit a couple of weeks ago. The gowns were spectacular and I also loved his more casual dresses. I’m reading the book now and it seems he also had a thing with high, tight sleeves. His “perfect” tailored sleeve took years and, according to him, 20,000 dollars to develop. The book describes how he altered the grain to accommodate the natural angle of the arm. Now I’ll be experimenting with that. What an excellent post. Thank you for the detailed look into your process. Glad you found it interesting. I searched forever on this topic and finally decided I had to research it myself. Fascinating. You make me wonder how much a draped sleeve would differ from this one. I’m also surprised at the symmetry of the cap, my own experiments with drafting a sleeve resulted in a much more asymmetric cap. 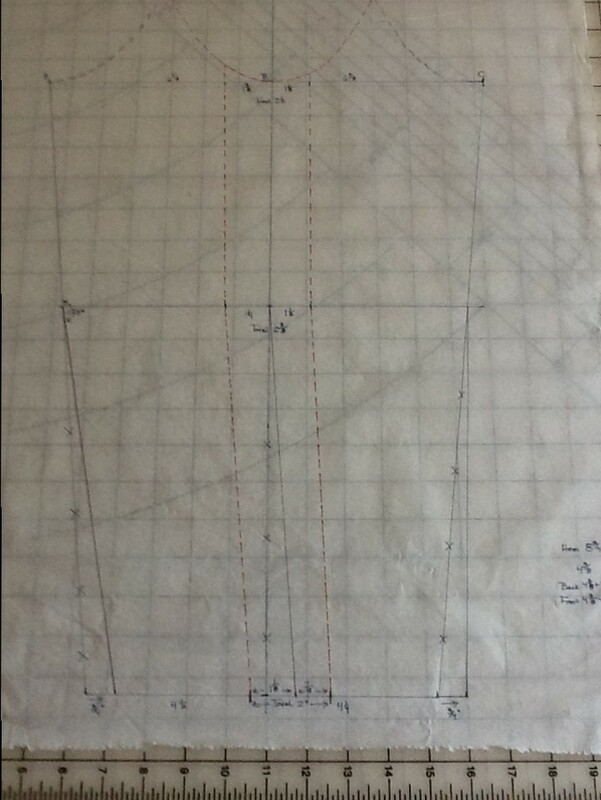 This was how to draft a three piece sleeve from an existing pattern. I used a Vogue pattern that many have used for a Chanel style jacket. That accounts for the sleeve cap shape. In my next post I’m planning to cover drafting a sleeve. I have experimented extensively with the German drafting systems and I know what you mean about the asymmetric sleeve cap. Please watch for the next post. I would love hear your comments. The time and research shows in this post. The photos are excellent visuals. Well done. Hope you will be discussing the scye shape–getting the correct shape–and how to achieve a high underarm. Thanks for following. 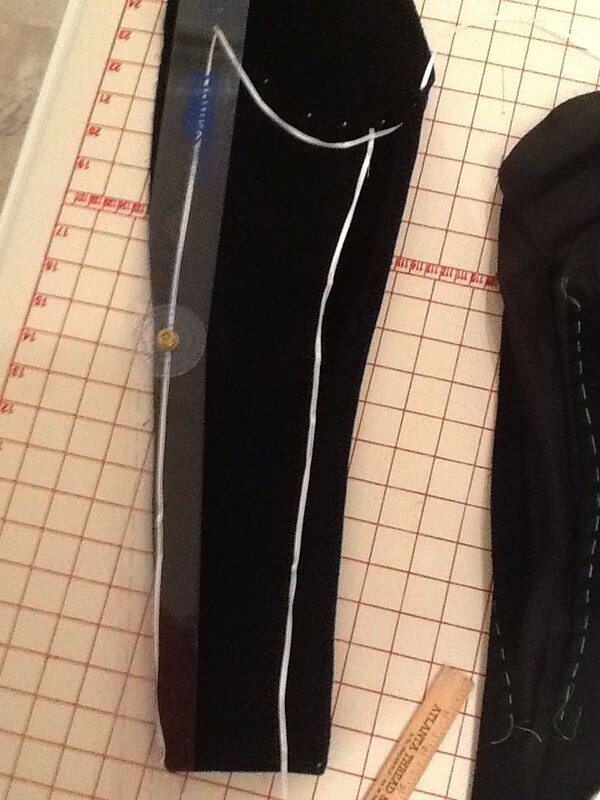 The next post will be devoted to custom fitting, fine tuning the scye shape and drafting a sleeve to fit that shape. I started with a commercial pattern as a first step. Please comment if you are familiar with alternate systems. My research has shown there are multiple drafting systems, each with some unique features. So happy to hear it was useful and easily understood. I’m hoping to get the next installment out next week. It will cover an alternate method for drafting a custom sleeve to fit your scye. The cap of the sleeve is shaped differently than commercial patterns. I have been working my way through several European drafting systems and am hopeful they will help other sewers produce couture shaped sleeves. I would love to see photos of your toile and finished jacket. Sorry, I’ve been so slow. I cut the sleeve and it hangs and fits beautifully, but then spent the last few weeks fiddling with the bodice to make it fit better. Anyway, your sleeve is nice and narrow (which I love) and it fits my Vogue 7975 armscye perfectly. So to anyone else out there who wants to convert their 2-piece sleeve to a 3-piece draft, I say follow Mary’s instructions and go for it! However, I’ve only just realised that the 7975 armscye is too big for me – although fortunately I had an inkling as I cut a very small armscye to begin with. Compared to my 7975 thread trace, I think I’ll be raising the underarm by about 1/2″ and shortening the shoulder seam maybe 1/4″ to make it look less ’80s. Would you have any tips on how to adjust the sleeve capline accordingly? Your 1 Oct post finished jacket sleeve looks perfect – this is my first big sew, so if I could get even halfway close to yours, I’d be ecstatic! Thanks again for sharing. 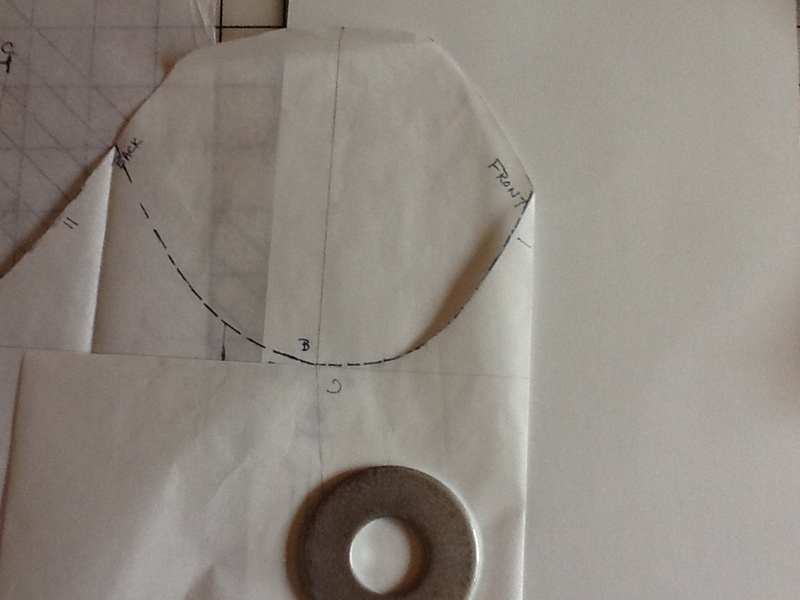 I redrafted the sleeve following the method by Elizabeth Allemong in her book European Fit. I raised the underarm 1/2 inch and narrowed the shoulder about 1/4 inch. I raised the height of the sleeve cap 3/8 inch. If the 7975 sleeve pattern fits you then use it. I preferred the sleeve cap shape in European Fit. That sleeve cap has a flatter back shoulder shape and more curve in the front. Start by raising the cap height and see how that works. Always happy to help. Let me know if you need more info. Hi Mary, that’s fantastic – thanks so much. I raised the sleeve cap and it looks like that has done the trick! Really appreciate your help. Glad that fix worked and thanks for letting me know. I would love to see your finished jacket. Happy you enjoy reading about my adventures in sewing. Thanks for following. The only reason for mentioning the offset seam is to point out that if you drop a line perpindicular from the shoulder point it will not divide the sleeve in equal halves. The shoulder point is more forward. Hope that answers your question. It does, thank you very much. Now, another question please…the width measurement on my sleeve bicep is different from the vogue pattern you have used for your tutorial (ie bicep=14.5,). In starting the underarm piece, you measure out along the underarm line 1 and 3/8 inch left of B and measure 1 and 1/8 to right of B. Are those specific to a bicep of 13 or should the measurements used become proportional with larger sizes? If your bicep measurement is different then I would adjust the size of the underarm sleeve section. 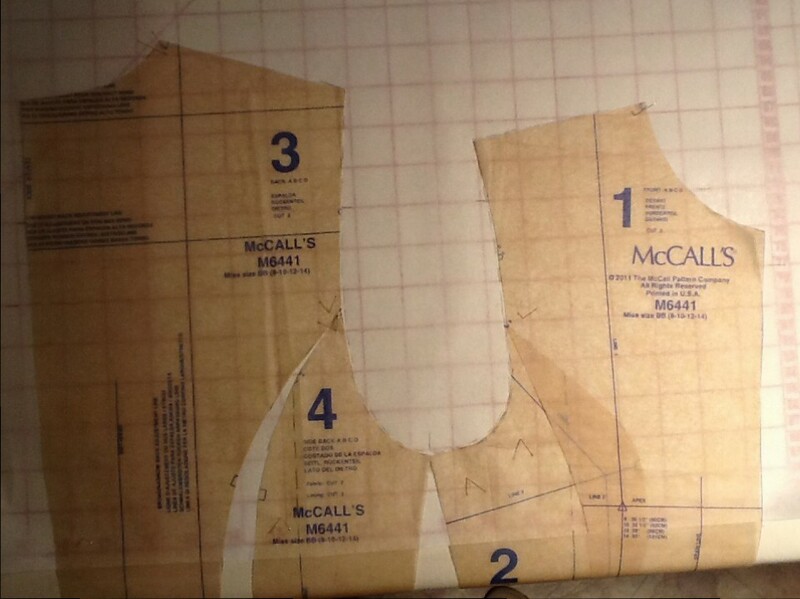 This was meant to show one method of creating a three piece sleeve from an existing two piece sleeve pattern. Look at some multi-sized patterns and you’ll get an idea of how much larger or smaller to make individual pattern pieces. On the undersleeve section I wouldn’t make it too much larger, maybe 1/8 to 1/4 inch added to each side. The idea is to keep the underarm seams where they won’t be noticeable. Hope this helps and i’m always happy to answer questions. I’m not thrilled with the sleeve shape on most commercial patterns and my next post on Vogue 1440 will be on drafting the sleeve from scratch. 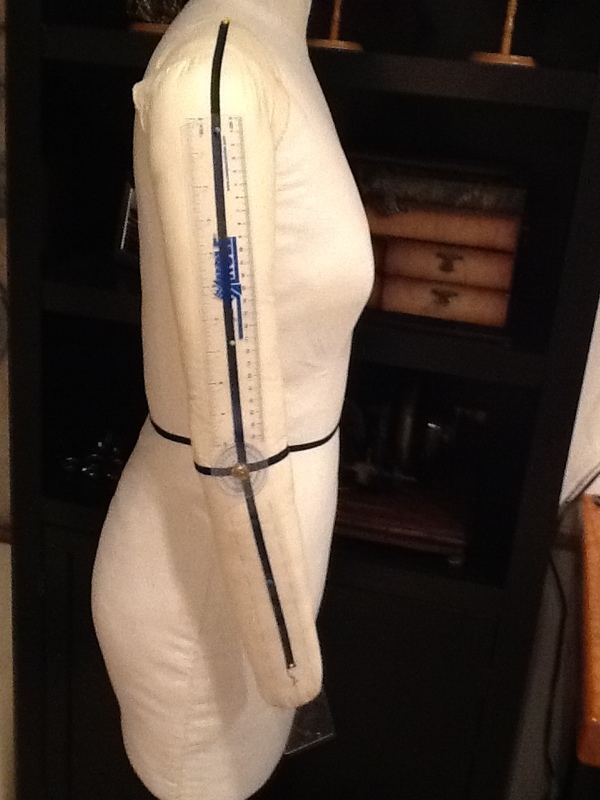 The draft is based on actual armhole, bicep, elbow and wrist measurements. I really appreciate your quick response to my questions. 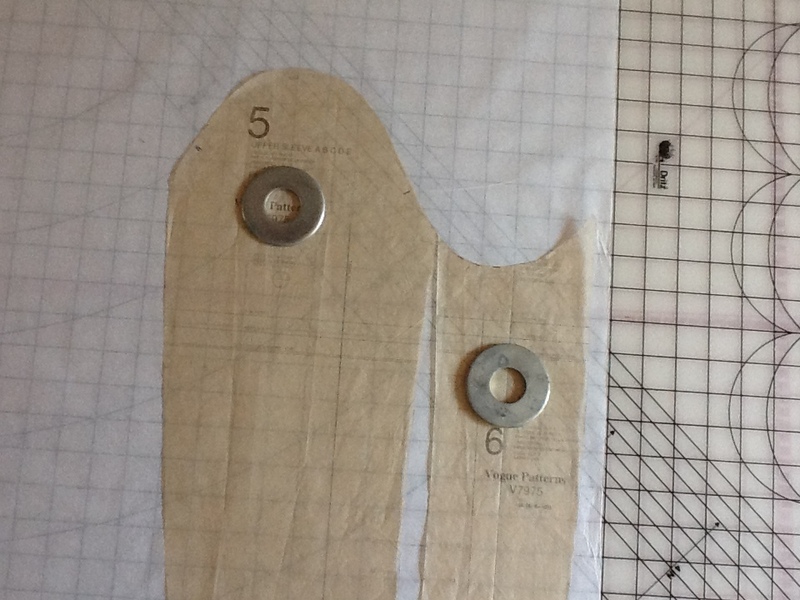 My underarm seamlines are in a good place so I’ll leave them alone, the piece measures almost 2.5″. Your tutorial on this 3 piece sleeve was a lifesaver for me. I use a software program for my patterns and needed your help turning the set in sleeve into the 3 piece. I’m not sure what I would have done if I hadn’t found your wonderful post. I don’t know about you, but the first thing I look at on a jacket is the sleeve. Thank you, thank you for your blog. Happy to be able to help you. When I began my own search for how to draft a three piece sleeve I found very little info. Most of what was available was too basic for my needs and so had to figure this out on my own. I also look at jacket sleeves. Having a well fitted slim sleeve makes any figure look good. Hello name ardena love the,three piece sleeve only problem I’m dyslexic learn by watching videos,hard to follow directions from reading …Will you ever have,a step by step video making a three piece sleeve? Not sure if you’re still checking this post since it’s from a while back, but WOW. I’ve been working with V8804 to make a cardigan jacket and was really quite unhappy with the way the sleeves turned out on my muslin. After messing with it for a while I gave up and decided to draft a new sleeve based on your instructions. An hour later and I’ve got a brand new sleeve ready to test out. You’ve given me hope that I may yet achieve a great sleeve fit! I have tried Vogue 8804 also and, like you, was quite unhappy with the sleeve. Thanks for letting me know you found my directions for drafting a custom sleeve helpful. I do get notifications of all comments, no matter how old the post so let me know if you need further tips. Hi Mary — I finally got far enough into my jacket that I could try out the sleeve muslin, and although it fits much better than the original V8804 sleeve, I have a fairly deep wrinkle forming on the front piece of the three piece sleeve. I can make it a bit better by pinching out some fabric from the front piece only near the seam line, but it’s going to result in a really wacky looking pattern piece, and I feel like there must be a better fix. Any thoughts? They would be greatly appreciated! Your sleeve looks like it has too much ease in the width. Chanel sleeves are drafted with minimum ease in the biceps area. It looks like your sleeve has more than enough ease throughout the entire sleeve. I would try slimming all the sleeve sections by taking evenly spaced vertical tucks out of each section. Keep your tucks small, about 1/4 inch, so as not to disturb the basic shape of each section. You might need more height in the sleeve cap. As sleeves become narrower and more fitted the cap height increases. Look at a man’s shirt: the sleeve is wide with a short sleeve head. The sleeve needs to gradually taper from the underarm point. I definitely wouldn’t curve the sleeve inwards through the biceps and then out at the elbow point, resulting in your “weird shaped” pattern. Good luck with the fitting and I’m always happy to try and help. One added thought: you might need to raise the underarm seam. 1/4 to 1/2 inch can make a huge difference. Don’t forget to make this adjustment on both the jacket body and sleeve. As the fit becomes slimmer, you need a higher underarm. Thanks for the detailed reply! I have raised the armscye by 1/2″ already, but honestly I think I could raise it even more — it’s really quite big in the original pattern. Both the bicep ease and sleeve cap height issues make sense to me, so I’ll mess around with both of those parameters and see if I can get a better draft. I think I drafted the sleeve with 2.5″ of ease around the bicep (which is what I would typically prefer for myself in a jacket), but I’ll bump it down to 1.5″ and see how it feels/looks. Also check the next post which is Part 2 and addresses more issues with the sleeve head and shaping of it. 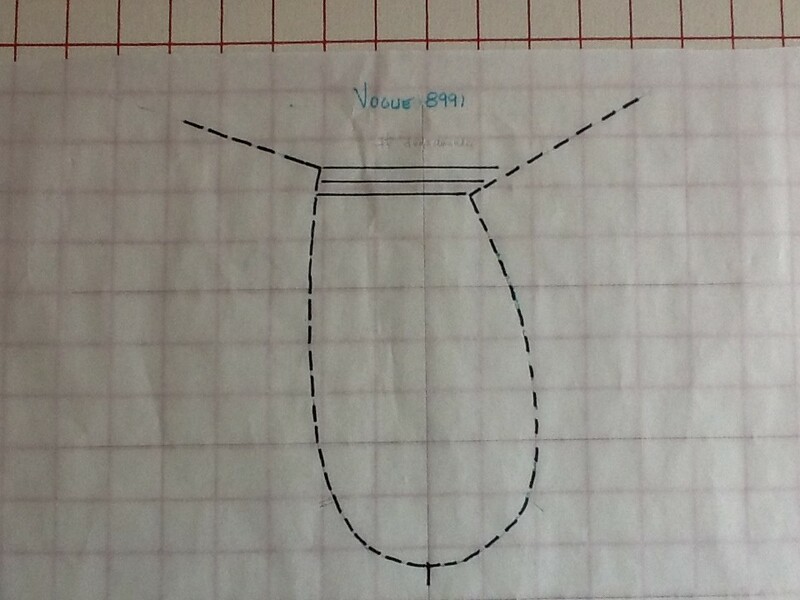 I mentioned European Cut by Elizabeth Allemong which I found very helpful in drafting a new sleeve pattern rather than using the Vogue one. If you are interested in trying Elizabeth’s methods order from her website (vestisbooks). I have no affiliation, just liked how her method works. The book is $200 on Amazon! I use about 1.5 inches biceps ease which does give a much slimmer cut. The written detail along with supporting photos are true education. I appreciate your efforts and will be using the information you shared within the month. Thank you for letting me know this was helpful info. What a brilliant post, so much information that is not available in any of my couture sewing books. Now it is clear why my arm movement is constricted in many jackets. Thanks so much for this eye opener. Thanks so much Blanca for your feedback. Glad the info is useful. I try and cover topics that aren’t explained in many resources. Hi Mary, I took a research on this 3 piece sleeve and you made this tutorial so perfect. Thank you for sharing 🙂 <3! "Add 1/8 inch to back and subtract 1/8 inch from the front." – From which point of the back should I add 1/8 inch and subtract from the front? 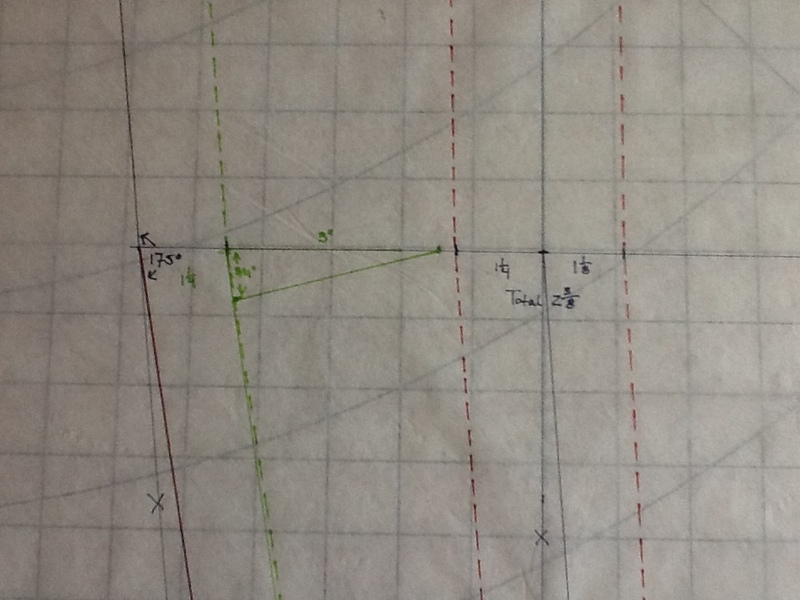 "The line down the middle of the sleeve is offset 1/4 inch towards the sleeve front"
– Is the offset then connected with the straight line with an elbow and becomes a new line from which we then measure 4 and 1/2 inches along the back and 4 1/4 inches along the front? Thank you in an advance! Thanks so much for reading and letting me know. I think you are referring to the width of the underarm sleeve section. 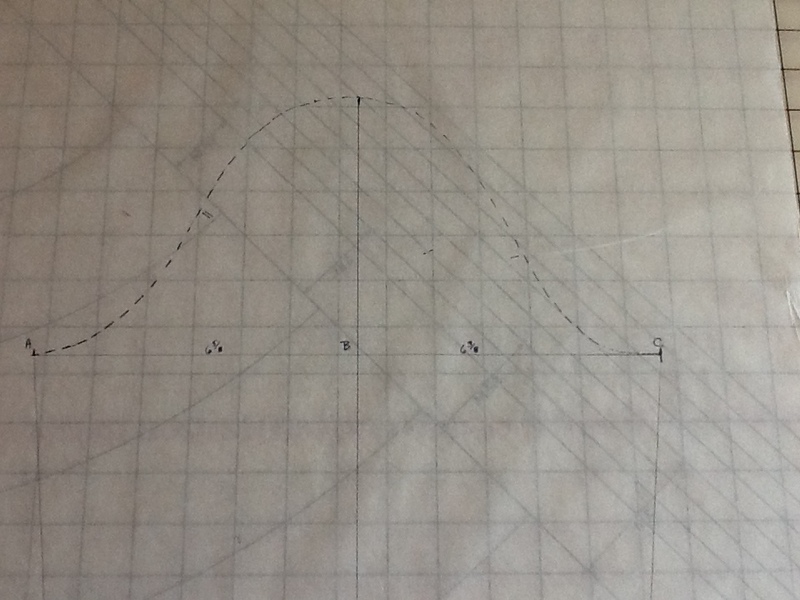 By adding to the back and subtracting an equal amount from the front the biceps width stays constant but the greater width is shifted to the back. This places the seam closer to the back elbow where easing is required. Your second question: the center of the sleeve drops from the shoulder point to the elbow and then angles to the hem. This creates an elbow angle to mimic the natural shape of the slightly bent arm. I’ll try and do an updated post with clearer instructions and illustrations soon.